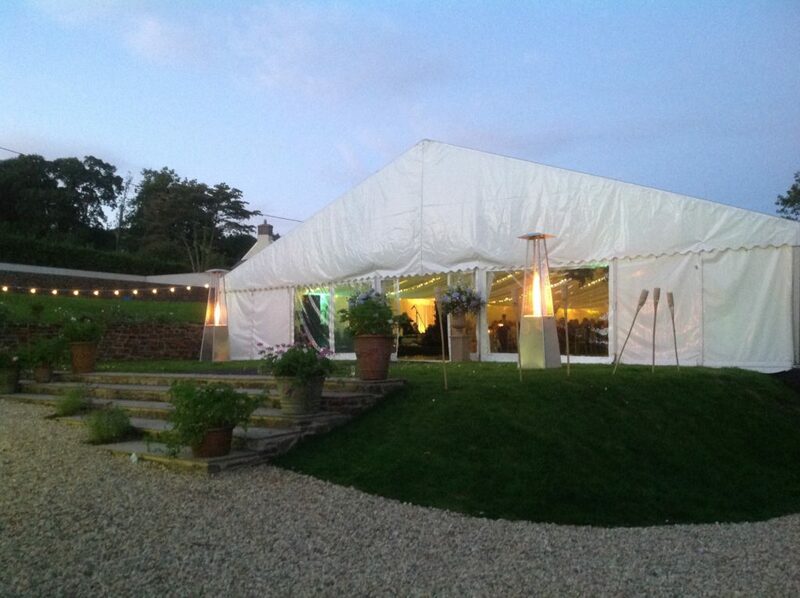 South West Marquees keeps growing: the range of marquees, furniture, linings and lighting expand organically as our customer base increases. This means that any project that really stands out has to be extra special! When Isabel first contacted us to discuss her wedding in Devon with 8 months to prepare, she said it would be worth having a look at the site as it is a little unusual. I arrived to find a sloping semicircle of lawn at the front of the house that could just fit a marquee, not ideal especially as guest numbers were around 250. Being someone who tries to find the positives in any site, we drew up a plan that would work, but it did have drawbacks, for a start the marquee would completely block the stunning view as well as the frontage of the house, which was looking a little tired, “don’t worry they said, in a couple of months the house will look quite different!”. This was the first suggestion I had that they may be prepared to do work to make this really possible. A month later Isabel calls me, “we have had a new idea could you come and have a look?” When I arrive I am shown a new site to the side of the house that I had previously ignored due to the fact it was steeply sloped and not big enough. “Show us how big you need it and we will make it level”. 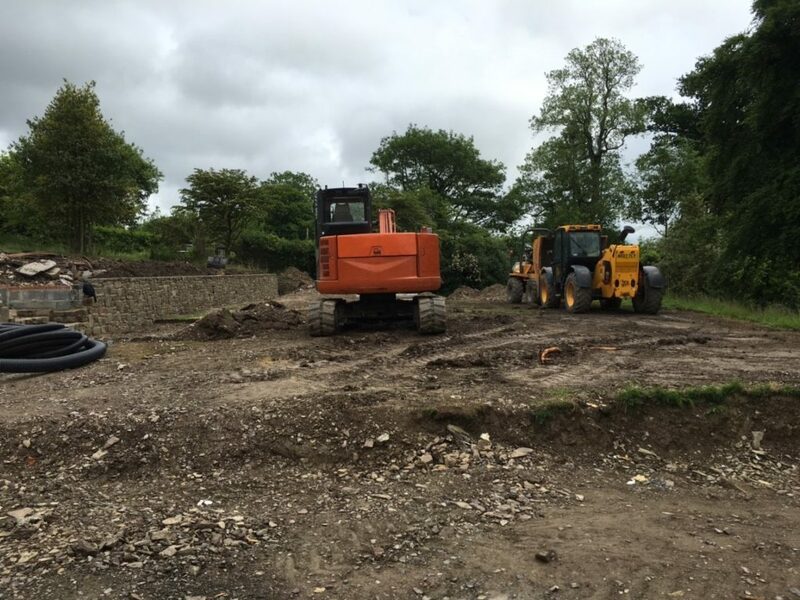 This is highly unusual for us, normally we are given a piece of ground to use and told to make it work, how exciting to have a customer that was prepared to move large amounts of earth and take on building work to make this happen! The only drawback is that this is now only 8 weeks before the wedding. 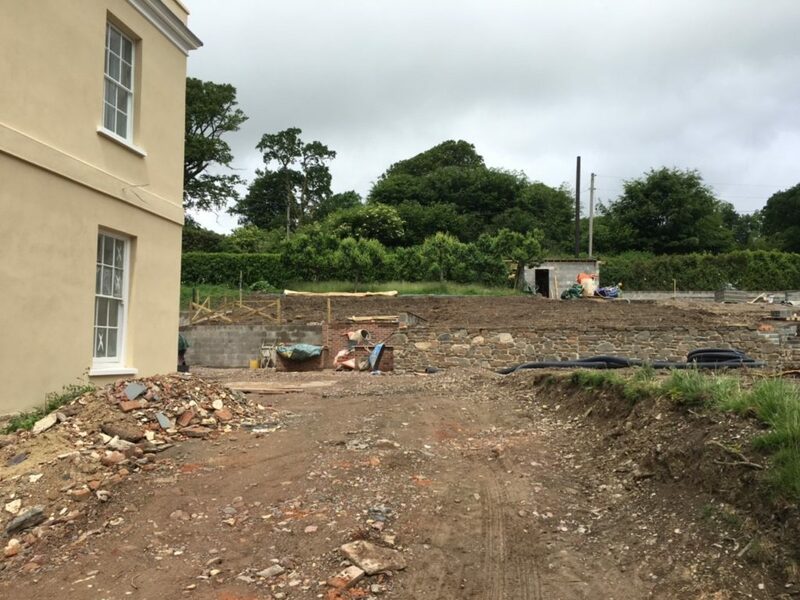 To fit this in as well as a complete makeover of the façade of the house alongside a brand new outdoor swimming pool is looking optimistic to say the least. However I am reassured by the confidence and competence of Rupert who is overseeing the work. A week later and I receive some encouraging pictures, still what will we find when we arrive? Leaving the yard at the crack of dawn, after a 3-hour drive we arrive early on a Wednesday morning to find grand stone steps leading up to a perfect lawn, all traces of builders have been removed. 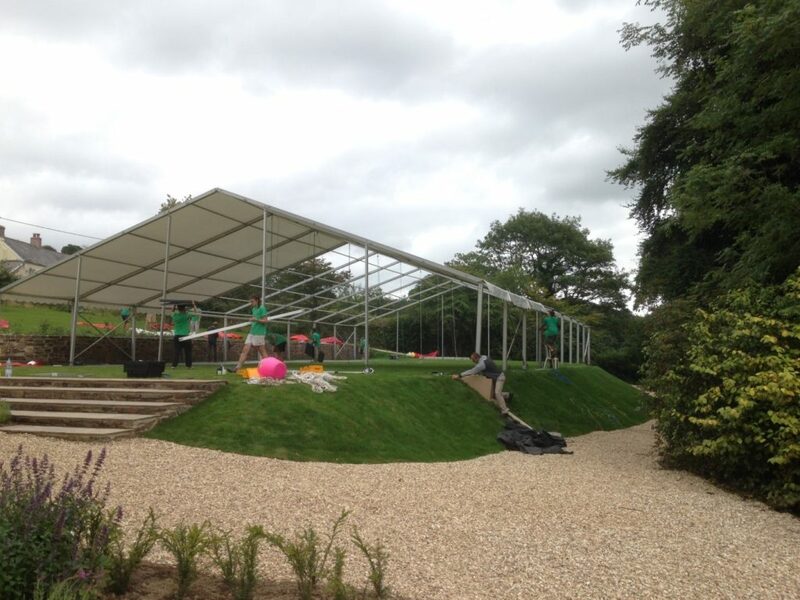 The only drawback is that the lawn has had to be made 3m shorter than planned due to site restrictions. I have to quickly come up with a plan B, I am always aware in situations like this that you can easily make an already stressful situation worse if you don’t handle it calmly. 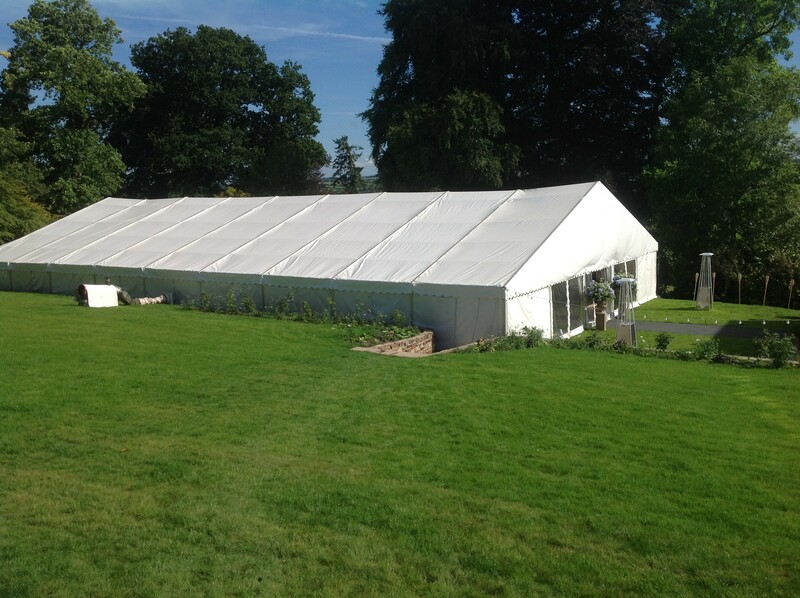 I realise that the catering area that was planned to be incorporated into the main marquee could be housed in a separate add on leaving us only with the problem of building up the 2 corners of the main marquee. This is where having a resourceful and competent team with you really pays off. We borrowed a chainsaw, a drill and some scaffolding planks and started building. Jarek built a small masterpiece as the rest of us concentrated on the main structure. Working on a hot August day in beautiful Devon sunlight made the rest of the project really smooth. Hard interlocking event floor, ivory linings, lots of warm fairy lights, Chivary chairs, luxury toilets, generators, fire pits, and even our new flame towers all started to appear, of course not forgetting a large dance floor! On a large project like this customers really value having a man on site to help with lighting adjustments and keep everything looking amazing throughout the night, one of our team Rich was on hand all night and took some photos. Removing the marquee on a Monday is always very different from the installation, but again we were greeted with hot cups of coffee and cold drinks throughout the day which was really helpful as it at least felt like the hottest day of the year. To finish off the bride’s mother offered us a swim in their brand new swimming pool, we weren’t going to turn that down! All in all an exciting project that was challenging but fun and was all made worthwhile when you see the finished product. A big thanks to Isabel for giving us the opportunity!